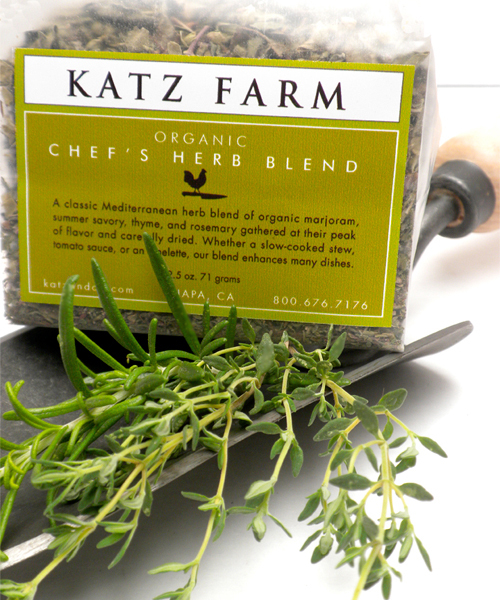 Inspired by the herbs de Provence of the French countryside, we collect locally grown, organic marjoram, summer savory, thyme, rosemary and tarragon picked and dried at the height-of-season to create our proprietary blend. It adds a bright seasoning to many dishes. We use our Chef's Herb Blend in so many dishes at home including grilled chicken or lamb, tomato sauces, vinaigrettes, and last but not least, omelettes. Gently crush a pinch into your own food creations! Olive Wood Mortar and Pestle is the ideal tool for grinding these natural herbs.